Expelled figures linked to the former Militant wing of the Labour Party have formally applied to rejoin Labour. The 75 applicants include former Militant leaders Peter Taaffe and Dave Nellist, who was Labour MP for Coventry South East for nine years. They cite Donald Trump's election as US president as a motivation to "assist the struggle to transform Labour". The internal battle with the Militant tendency faction was one of Labour's biggest controversies of the 1980s. Mr Taaffe, who was expelled from Labour in 1983, said: "We want to play our part in the struggle to transform Labour and urge the National Executive Committee to aid this process by admitting us, and others who have been similarly expelled or excluded, into membership." 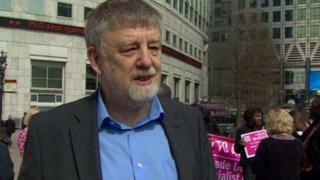 Mr Taaffe, now the general secretary of the Socialist Party, was expelled along with ex-MP Mr Nellist - now the chairman of the Trade Unionist and Socialist Coalition (TUSC). Their affiliations with Labour rivals mean it appears unlikely that their applications to rejoin the party will be approved. A Labour spokeswoman told the BBC: "It is against Labour's rules to be a member of another political party or organisation which has its own programme, principles and policy, or distinctive and separate propaganda, and which is therefore ineligible for affiliation to the party." The application comes after Labour leader Jeremy Corbyn was caught up in a row over warnings of Trotskyist entryism from deputy leader Tom Watson. In August 2016, shortly before Mr Corbyn's successful re-election as leader, Mr Watson wrote to him saying "It's not a conspiracy theory to say that members of [Militant] are joining Labour. It's a fact." The Labour leader told The Observer his deputy was talking "nonsense", saying: "I just ask Tom to do the maths - 300,000 people have joined the Labour party. "At no stage in anyone's most vivid imagination are there 300,000 sectarian extremists at large in the country who have suddenly descended on the Labour party." The 75 expelled Labour members have pitched their application directly at Mr Corbyn, saying his re-election in September "marked the beginning of a new struggle against a capitalist establishment"
Their statement continued: "We want to play our part in seeing that struggle through to victory." Who, What, Why: What was Militant?